"You are the world's greatest singer/songwriter!" Universal has finally unveiled the first official trailer for the new movie directed by Danny Boyle, officially titled Yesterday - formerly known as All You Need Is Love. From writer Richard Curtis (Notting Hill, Love Actually, About Time), the original concept for this movie is crazy - one day everyone wakes up and the entire world has never heard of The Beatles. Except for one guy. Who becomes famous for singing/playing all the classic Beatles songs, because no one knows that it isn't him who came up with all of this genius work. As wild as that seems, only Danny Boyle could pull that off and he seems to have done that. 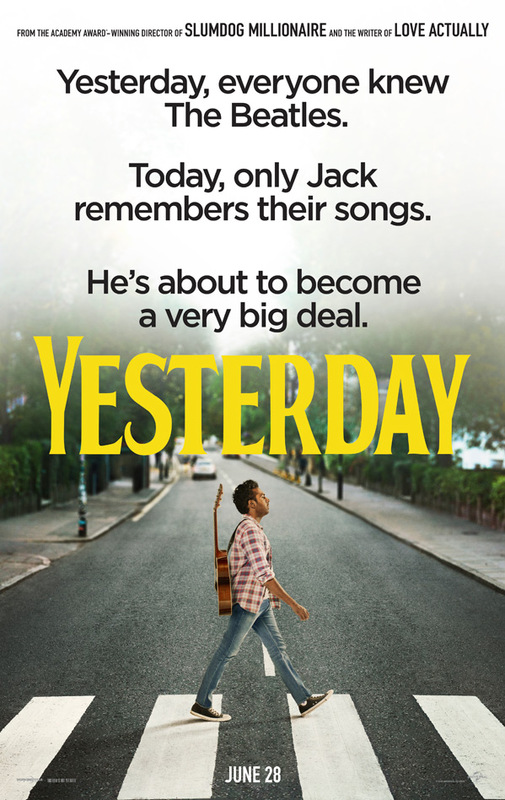 Himesh Patel (from "EastEnders" and "Damned") stars in Yesterday, along with Lily James, Kate McKinnon, Ed Sheeran, Ana de Armas, Joel Fry, and Camille Chen. This looks as amusing and enjoyable as I hoped, and I can't wait to see it. Don't miss this first trailer below. Jack Malik (Himesh Patel) is a struggling singer-songwriter in a tiny English seaside town whose dreams of fame are rapidly fading, despite the fierce devotion and support of his childhood best friend, Ellie (Lily James). Then, after a freak bus accident during a mysterious global blackout, Jack wakes up to discover that The Beatles have never existed… and he finds himself with a very complicated problem, indeed. Performing songs by the greatest band in history to a world that has never heard them, and with a little help from his steel-hearted American agent, Debra (Kate McKinnon), Jack’s fame explodes. But as his star rises, he risks losing Ellie — the one person who always believed in him. With the door between his old life and his new closing, Jack will need to get back to where he once belonged and prove that all you need is love. Yesterday is directed by acclaimed British filmmaker Danny Boyle, of Shallow Grave, Trainspotting, The Beach, 28 Days Later, Millions, Sunshine, Slumdog Millionaire, 127 Hours, Trance, Steve Jobs, and T2 Trainspotting previously. The screenplay is by Richard Curtis, from a story by Jack Barth. Universal Pics will release Yesterday in theaters everywhere starting on June 28th this summer. So how does that look?